This is the eighth volume of Babel und Bibel, an annual of ancient Near Eastern, Old Testament, and Semitic studies. The principal goal of the annual is to reveal the inherent relationship between Assyriology, Semitics, and biblical studies--a relationship that our predecessors comprehended and fruitfully explored but that is often neglected today. The title Babel und Bibel is intended to point to the possibility of fruitful collaboration among the three disciplines, in an effort to explore the various civilizations of the ancient Near East. This volume is a festschrift for Joachim Krecher, Professor of Assyriology in the Westf lische Wilhelms-Universit t M nster. Krecher is best known, perhaps, for his seminal Sumerische Kultlyrik, published already in 1966. 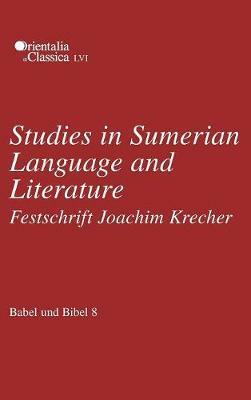 This compendium includes 17 essays by friends and colleagues, all focusing on Sumerian language and literature.